Programs itself and saves energy. Connect the Nest Thermostat to Wi-Fi to control it from your phone. Get alerts on your phone if your home gets dangerously hot or cold. You’ll never have to adjust your thermostat again. Smart features allow Nest to learn what you like and adjust accordingly. No more confusing programming. 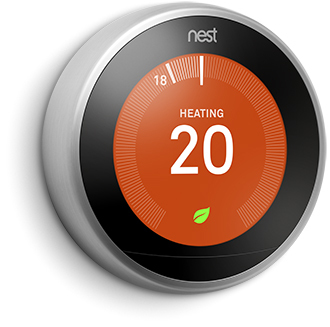 Nest Thermostat learns the temperatures you like and programs itself. 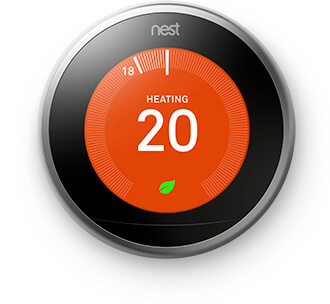 The Nest Thermostat automatically turns itself down when you're away to avoid heating or cooling an empty home. When the Nest Thermostat spots you across the room, it lights up to show you the time, temperature or weather. Pop off your old thermostat and install your new Nest - It should take about half an hour. Now turn up the temperature and get comfortable. Manage your Nest product features and options wherever you are. You can easily change the temperature of your home from the subway or the sofa with the Nest app.